During the DeKalb Area Arts Council’s DeKalb/NIU Art Walk, enjoy an after-hours public reception and gallery talk at the Jack Olson Gallery in the NIU School of Art and Design, Arends Hall 200 ,on Thursday, Oct. 6 from 4:30-6 p.m. The gallery talk will be at 5 p.m. Hear Dr. Ian Holliday, collector of the Thukhuma Collection, Hong Kong, professor of political science, vice president and pro-vice-chancellor (teaching and learning) at the University of Hong Kong. 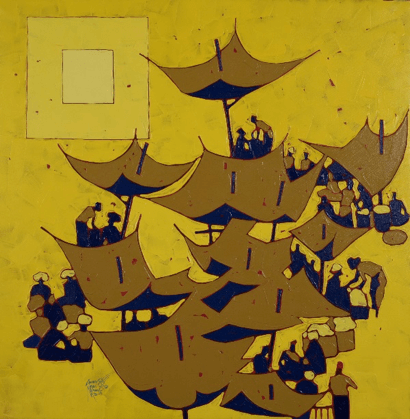 Dr. Holliday will discuss his collection practice and the works of current Burmese artists’ work that he has amassed which reflect the country’s political and social turmoil as well as the artistic response to issues of contemporary times. More information about these events and the Jack Olson Gallery may be found online by visiting niu.edu/olsongallery or call 815-753-4521.